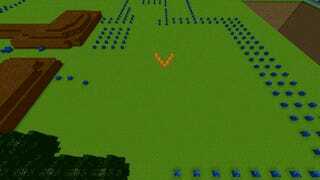 The Original Pokemon Games, Recreated In Minecraft. Wow. For many, Pokemon Red and Blue are the most memorable and important Pokemon games—so it's hard not to be impressed when you watch MediocreJake recreate all of it in Minecraft. Yes, from Pallet Town to all the different roads and locations we see in Kanto. You may be wondering, hey, where are places SS Anne or Mt Moon? Basically, anything that is "indoors," like caves, is counted as an interior. Interiors are being built on a separate part of the map, and MediocreJake plans to set up warps to access them. Hopefully he uploads those locations once they're done, too. Definitely the sort of thing that takes a lot of work, and while we can't see certain locations just yet, it's still awesome. And, hey, once he's done? Johto is next.